Dear Hilary & Simon, sorry you are not here, skiing and resort are absolutely 1st class, Only bad part so far was a 9 hour coach transfer. chalet idea is really good, food excellent. Andy & Kevin both wish you could have made it, but who knows, next year? Hope things are under control with you. Take care, love John. Another card from Val d’Isère and John, together with Kevin and Andy, is obviously enjoying the resort. The text here indicates that we should have been with them on the trip. 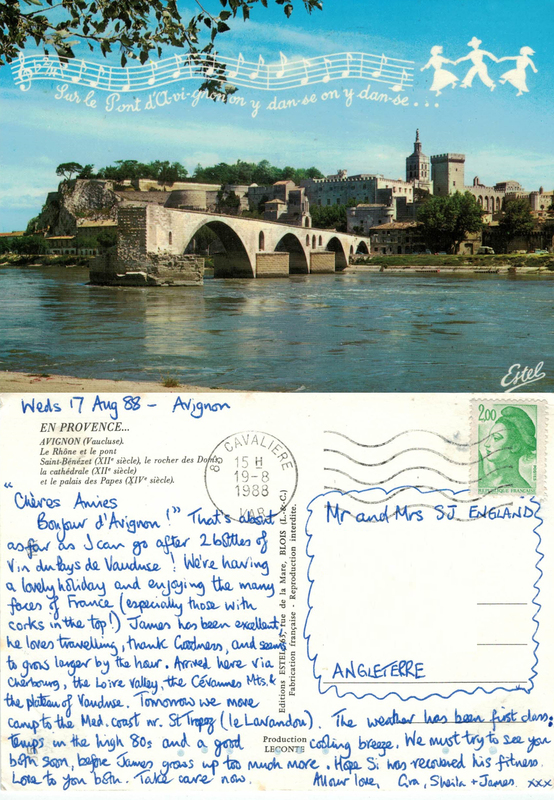 The card is postmarked 1991 and carries the 1989 Marianne de Briat definitive stamp. John is my brother; we learnt to ski as children in the 1970’s with our forward thinking parents, who took us on several package trips to Austria, when ‘winter sports’ holidays were something of a novelty. Simon and I were due to be on this trip to Val d’Isère, but the UK was in the midst of a recession at the time and our bank manager, more or less, forbade us to go. We should have ignored him and gone anyway; the end result was the same! The French like photographing their ski resorts at night, don’t they? 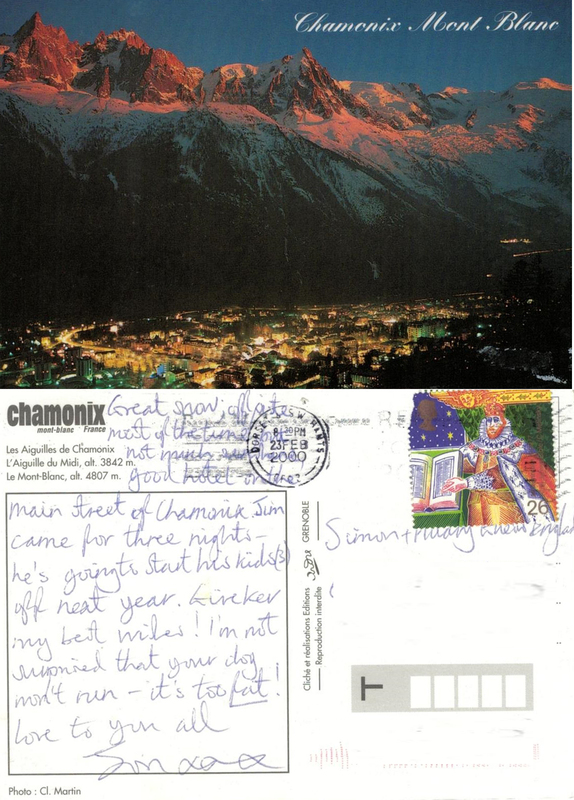 This time it’s Chamonix, which also featured a few weeks ago here. Despite obviously being written in France, the card was posted in the UK as it is postmarked ‘DORSET & W HANTS 8.30pm 23 FEB 2000’ and carries a 26p first class stamp. In 1992 we went skiing with Andy and Kev; Jon was staying in the same chalet; we all skied together, exchanged addresses and have been skiing together most years since then. We don’t see much of each other between ski trips, although on this occasion Jon must have recently visited us in order to note our slightly overweight dog!